If you have any questions about the CONDOR Tecnomar Nadara 41 RHP information page below please contact us. Superyacht Condor was launched in 2010 by the Italian shipbuilding company renowned for their state of the art technology and design. The 41.6 metre motor yacht is powered by 2 x MTU 3200Hp 12V M90 main engines and can reach a maximum speed of 30 knots, cruising speed of 27 knots. Condor offers accommodation for up to 10 people in 5 cabins and also provides accommodation for a crew of seven in four crew cabins. To evolve, advance and grow is the motto that summarizes the Tecnomar philosophy and this is the second launch since the beginning of the year for the new majority shareholder, President and Chief Executive Giovanni Costantino. The other shareholder is Venice SpA, the private equity fund of Palladio Finanziaria, one of the most prestigious groups in Italian finance. Condor is built in fibreglass for a Greek lady owner. Condor is a one-and-a-half deck Flying Bridge yacht with a blue hull, cream superstructure and interior in eucalyptus wood. She is a new project that is part of the Custom Made philosophy. The Owner, assisted by her qualified staff, has lent a personal touch to the decoration of the yacht, with a refined taste and rounded lines. Paintings by Greek artists are hung in the interiors. On the main deck of superyacht Condor is a spacious living room with a divan to the perimeter and an area with a coffee table and comfortable armchairs. Also towards the bow is the galley which has direct access to the crew quarters and a large dining area that can accommodate up to 10 guests. There are five cabins on motor yacht Condor catering for 10 guests aboard. The Owner’s suite has the dimensions of a small apartment. There are two VIP cabins to the stern with double beds and two cabins with single berths. The crew quarters are further to the bow and the Captain has a double cabin. The Flying Bridge of Condor is large and furnished with a table, chairs, sofas and sunbeds for complete relaxation. The alfresco entertaining areas to the bow and the stern are comfortable and can accommodate numerous guests. 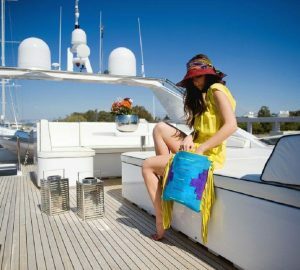 The yacht has Rina and A1 Maltese Cross certifications. We do have available further amenity, owner and price information for the 41.60 m yacht CONDOR Tecnomar Nadara 41 RHP, so please enquire for more information. The luxury yacht CONDOR Tecnomar Nadara 41 RHP displayed on this page is merely informational and she is not necessarily available for yacht charter or for sale, nor is she represented or marketed in anyway by CharterWorld. This web page and the superyacht information contained herein is not contractual. All yacht specifications and informations are displayed in good faith but CharterWorld does not warrant or assume any legal liability or responsibility for the current accuracy, completeness, validity, or usefulness of any superyacht information and/or images displayed. All boat information is subject to change without prior notice and may not be current.